Palmeira Car Servicing has over 20 years of retail motor trade experience, providing a friendly and efficient service, offering a full range of garage services for all makes and models of cars and light commercial vehicles. There are a lot of small problems that occur with cars that our car mechanics can diagnose and advise about over the phone. Perhaps you have noticed an unusual sound coming from your car whilst driving. In most cases this is nothing to worry about, but an explanation can help to put your mind at ease. Wherever possible, we will give advice over the phone, saving you the inconvenience of having to leave your car at the garage. 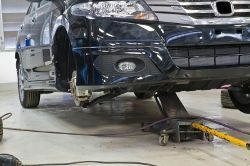 Of course, if we feel the problem may be more serious, we would advise a visit to the garage to carry out a thorough assessment and whatever car servicing repairs you may require. 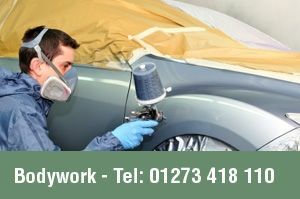 We also have Palmeira Bodyworks for all of your bodywork repairs from a small dent to a large insurance claim with courtesy cars supplied. 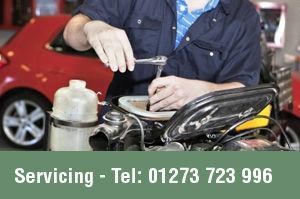 All car servicing work is guaranteed - call us today for a quote on our car repairs. We accept all major credit cards.